Seattle Reign FC spoiled Sky Blue FC’s home opener with a 1-0 win on a rainy and windy Sunday night at Yurcak Field in Piscataway, New Jersey. The Reign are now 2-0-0 on the season, while Sky Blue FC are now 0-2-0. The game was Carli Lloyd‘s first home NWSL game in a Sky Blue FC uniform, as well as the home debut of new coach Denise Reddy. Both Lloyd and Reddy are Rutgers alums and New Jersey natives. Lloyd got recognized before the game for scoring her 100th international goal with the U.S. women’s national team. Lloyd’s milestone was reached in the USWNT’s victory over Mexico on April 8. In just the fifth minute of play, Sky Blue FC got themselves in a difficult position after defender Erica Skroski was called for a handball in the box. NWSL’s reigning Player of the Month, Megan Rapinoe stepped up to take the penalty kick for the visiting Reign FC. In the sixth minute Rapinoe converted to earn her second goal of the season. In the 17th minute of play the Reign FC looked like they were going to get their second on the night. Midfielder Beverly Yanez had space down the right flank and served one across the box where Rapinoe was able to collect it. Rapinoe took a touch across her body to her left foot but was taken down by Kailen Sheridan. The play went on with no foul called. Jessica Fishlock not too long after Rapinoe’s chance fed Rapinoe through with a dangerous ball that split Sky Blue’s defensive line. Sky Blue defender Christina Gibbons kept Rapinoe in front of her and forced her to shoot at a difficult angle. The shot went high. Rapinoe finished the game with four shots and four on goal. After three weeks of NWSL games Rapinoe leads with 13 shots and 7 shots on goal. Sky Blue saw their best chances to equalize in the second half. Forward Shea Groom was dangerous in a 1-v-1 situation on the right side and was able to get a shot off, however her strike just kissed the post and was knocked away by Reign FC goalkeeper Michelle Betos. The play was a build-up from the midfield starting with rookie midfielder Savannah McCaskill. The second half continued on as weather worsened and both teams struggled to finish in the final third. However in the 86th minute, Seattle had the chance to double their lead after being awarded a penalty kick. The foul was called on Skroski and Reign FC’s Jodie Taylor stepped up to take the PK. Sky Blue’s Sheridan came up big at home and saved the low-driven right shot. The rebound went out to Reign FC’s Kiersten Dallstream and again, Sheridan made the follow-up save to keep her team within one. Sheridan finished the match with three saves to Betos’ one. Rapinoe left the game in the 57th minute with what appeared to be an injury to her left hamstring. Dallstream subbed in to replace her. Despite dropping three points at home, Sky Blue FC held the better end of the game’s possession with a 56.3% to the Reign’s 43.7%. The home team also had a higher passing accuracy on the slippery evening with 71.4% to the Reign’s 63.7%. Sky Blue FC will hit the road in Week 4 to play the Chicago Red Stars on Saturday, April 21. Seattle will continue their road trip and face the league-leading North Carolina Courage for a midweek game on Wednesday, April 18. Match ends, Sky Blue 0, Seattle Reign 1. Second Half ends, Sky Blue 0, Seattle Reign 1. Substitution, Sky Blue. Adriana Leon replaces Shea Groom. Attempt saved. Kiersten Dallstream (Seattle Reign) right footed shot from the right side of the six yard box is saved in the bottom right corner. Penalty saved! Jodie Taylor (Seattle Reign) fails to capitalise on this great opportunity, right footed shot saved in the bottom right corner. Penalty Seattle Reign. Jodie Taylor draws a foul in the penalty area. Substitution, Sky Blue. Madison Tiernan replaces Christina Gibbons. Kiersten Dallstream (Seattle Reign) is shown the yellow card for a bad foul. Substitution, Seattle Reign. Morgan Andrews replaces Jasmyne Spencer. Corner, Seattle Reign. Conceded by Christina Gibbons. Attempt saved. Shea Groom (Sky Blue) right footed shot from the right side of the box is saved in the top right corner. Assisted by Savannah McCaskill. Corner, Sky Blue. Conceded by Christen Westphal. Substitution, Sky Blue. Katie Johnson replaces Raquel Rodríguez. Attempt saved. Jessica Fishlock (Seattle Reign) right footed shot from outside the box is saved in the top right corner. Corner, Seattle Reign. Conceded by Mandy Freeman. Substitution, Seattle Reign. Kiersten Dallstream replaces Megan Rapinoe because of an injury. Delay in match Megan Rapinoe (Seattle Reign) because of an injury. Attempt missed. Sarah Killion (Sky Blue) right footed shot from outside the box is close, but misses to the left. Assisted by Carli Lloyd. Second Half begins Sky Blue 0, Seattle Reign 1. First Half ends, Sky Blue 0, Seattle Reign 1. Delay in match Jasmyne Spencer (Seattle Reign) because of an injury. Sarah Killion (Sky Blue) wins a free kick on the left wing. Dangerous play by Christen Westphal (Seattle Reign). Delay in match Raquel Rodríguez (Sky Blue) because of an injury. Corner, Sky Blue. Conceded by Megan Oyster. Corner, Sky Blue. 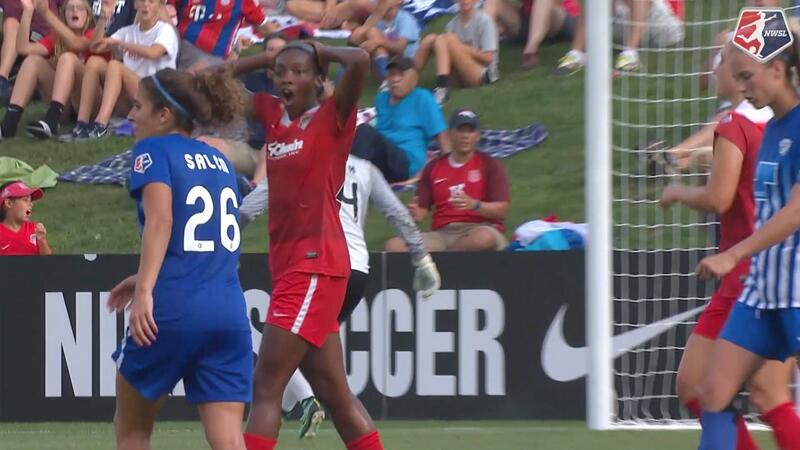 Conceded by Allie Long. Offside, Sky Blue. Sarah Killion tries a through ball, but Shea Groom is caught offside. Attempt missed. Megan Rapinoe (Seattle Reign) left footed shot from the left side of the box is close, but misses the top left corner. Assisted by Jessica Fishlock. Attempt missed. Raquel Rodríguez (Sky Blue) right footed shot from more than 35 yards is close, but misses to the right. Megan Oyster (Seattle Reign) wins a free kick on the right wing. Corner, Seattle Reign. Conceded by Carli Lloyd. Attempt blocked. Megan Rapinoe (Seattle Reign) left footed shot from the centre of the box is blocked. Assisted by Jodie Taylor. Attempt missed. Beverly Yanez (Seattle Reign) header from the centre of the box misses to the right. Assisted by Theresa Nielsen with a cross. Goal! 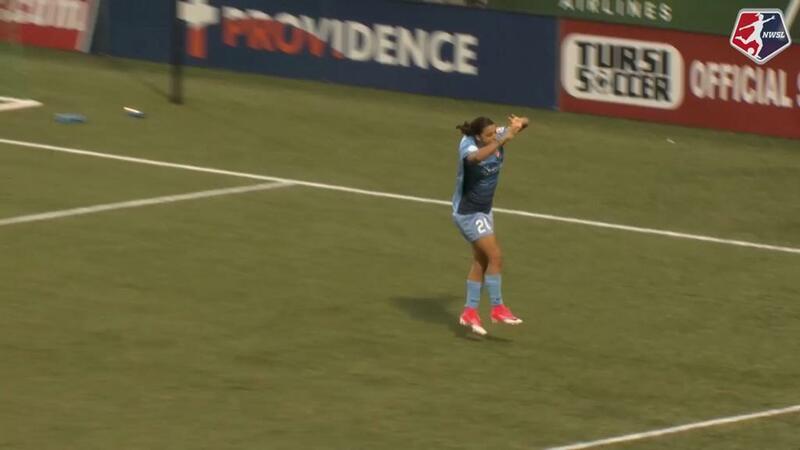 Sky Blue 0, Seattle Reign 1. Megan Rapinoe (Seattle Reign) converts the penalty with a right footed shot to the high centre of the goal. Penalty conceded by Erica Skroski (Sky Blue) with a hand ball in the penalty area. Attempt blocked. Megan Rapinoe (Seattle Reign) left footed shot from outside the box is blocked. Assisted by Theresa Nielsen. Attempt missed. 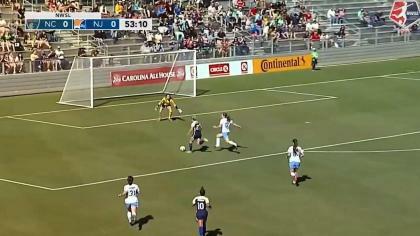 Carli Lloyd (Sky Blue) left footed shot from more than 35 yards misses to the left.